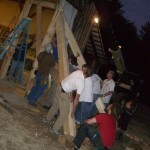 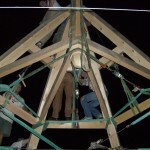 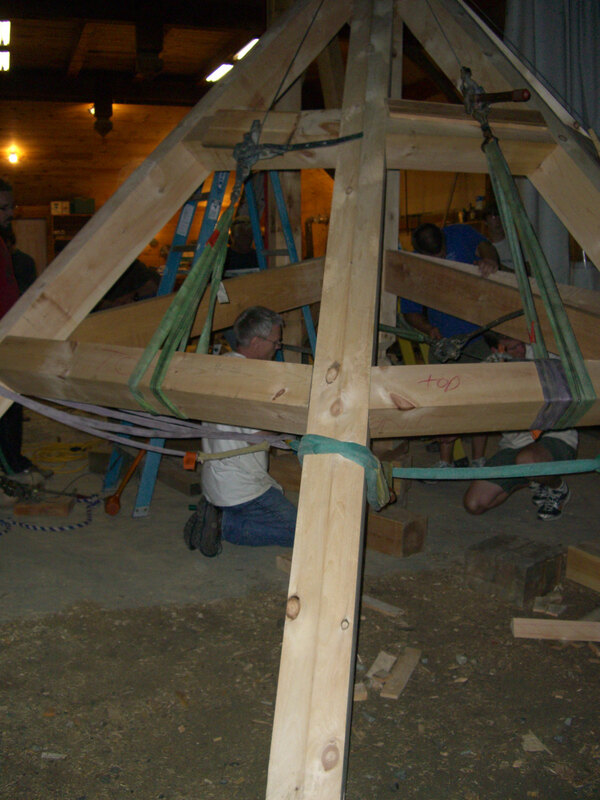 Again, after four days of instruction, we were turned loose on the timbers. 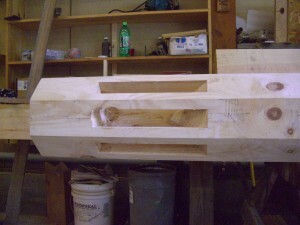 Our project for this week was a half-octagon addition for the front of the previous weeks’ Cape. 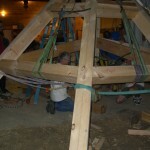 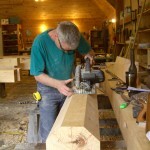 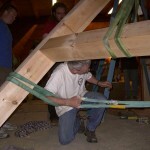 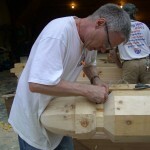 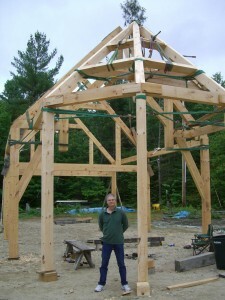 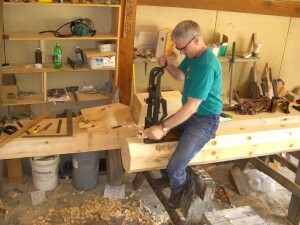 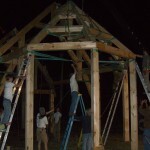 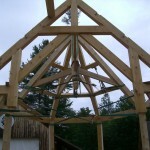 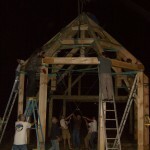 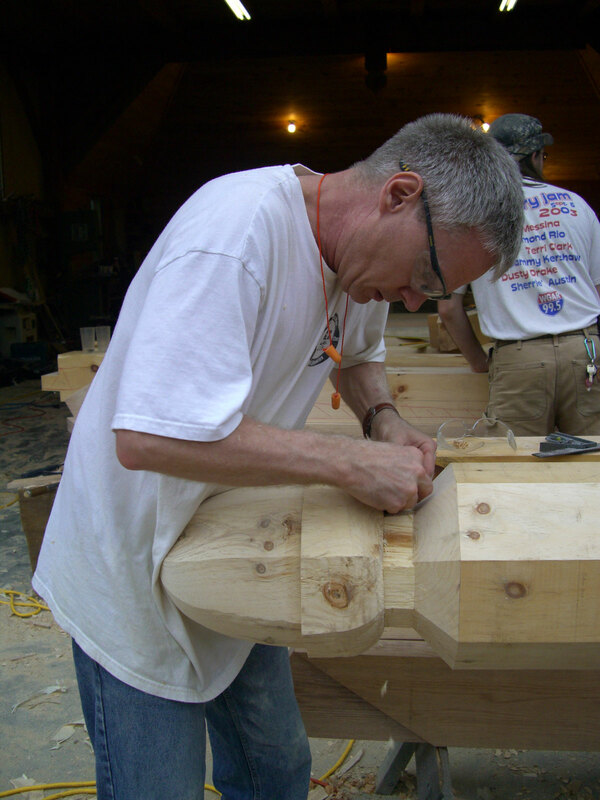 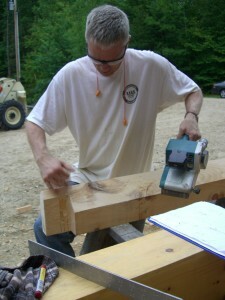 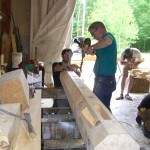 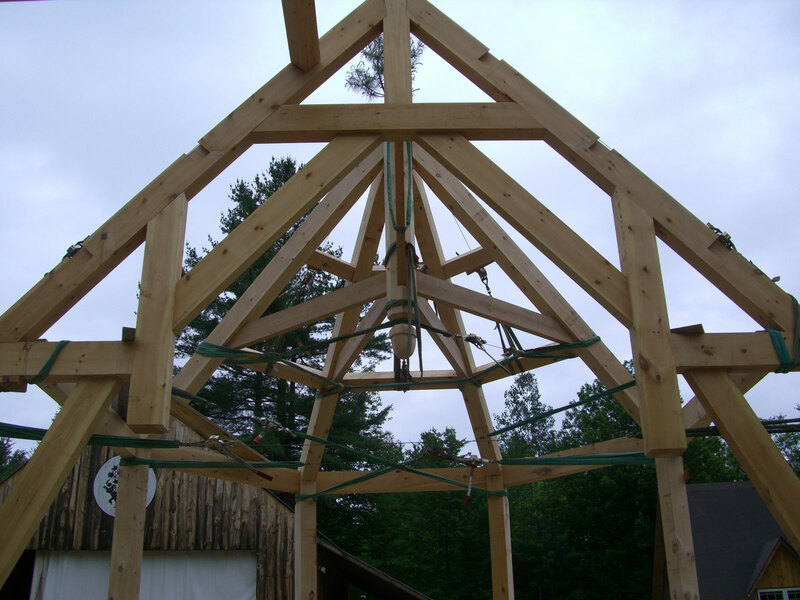 Here I’m starting on the King Post – the most important part in this addiiton as it ties all of the rafters together. 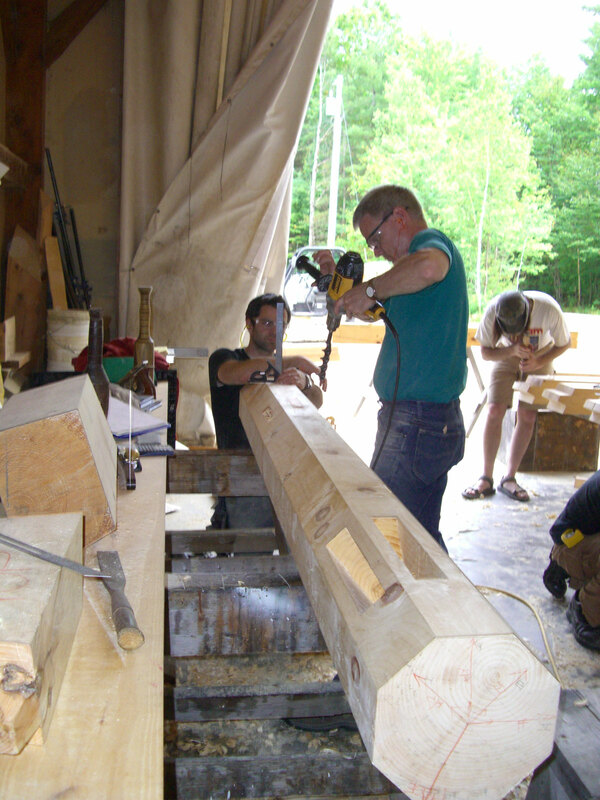 We’re getting ready to start the raising on Saturday afternoon, and I’m running around putting the finishing touches on the last few timbers. 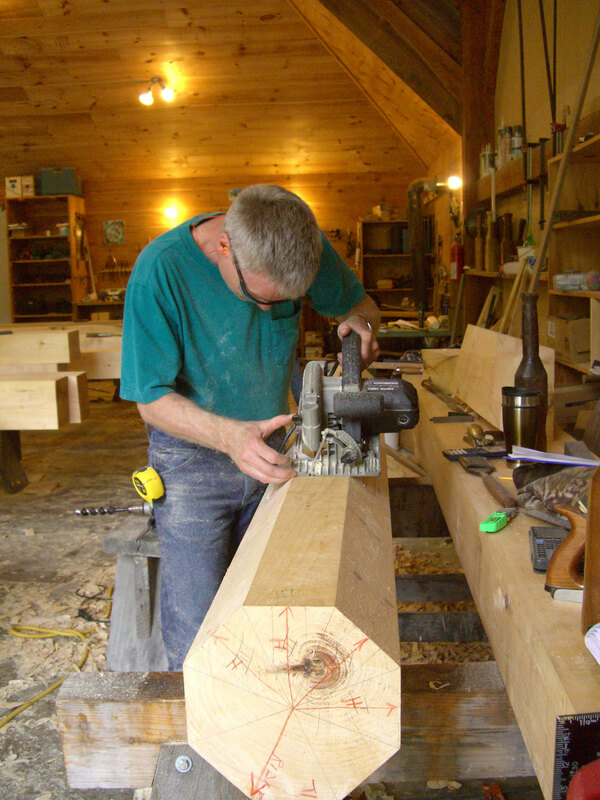 I’m smoothing off the peak on the ridge beam after cutting the tenons and slicing off the top at 45° on both sides. 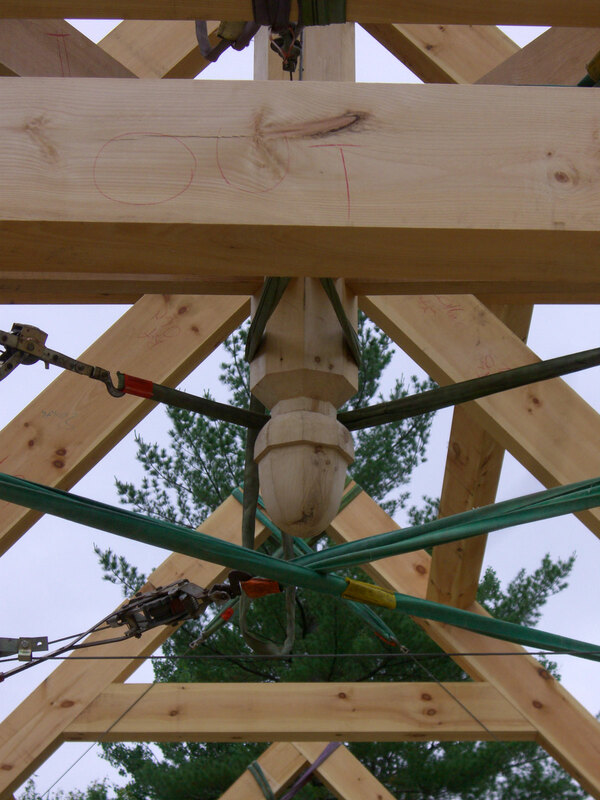 You can’t see it, but I’m using one of the nicest planes I have ever touched in my life to smooth the acorn finial on the King Post. I designed the acorn in AutoCAD on the laptop Friday night and calculated a series of kerf cuts on each side of the octagon to for the acorn. 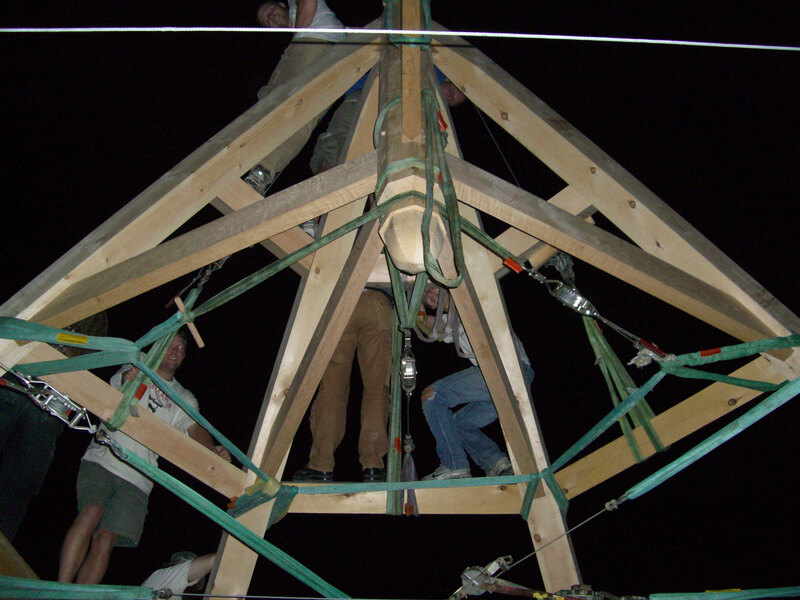 On Saturday, no one could see how this would work, but everyone said go for it,so I did. After 80 saw cuts, everyone was still skeptical, but I soon started knocking off the waste between the cuts and the acorn began appearing much to everyone’s relief. 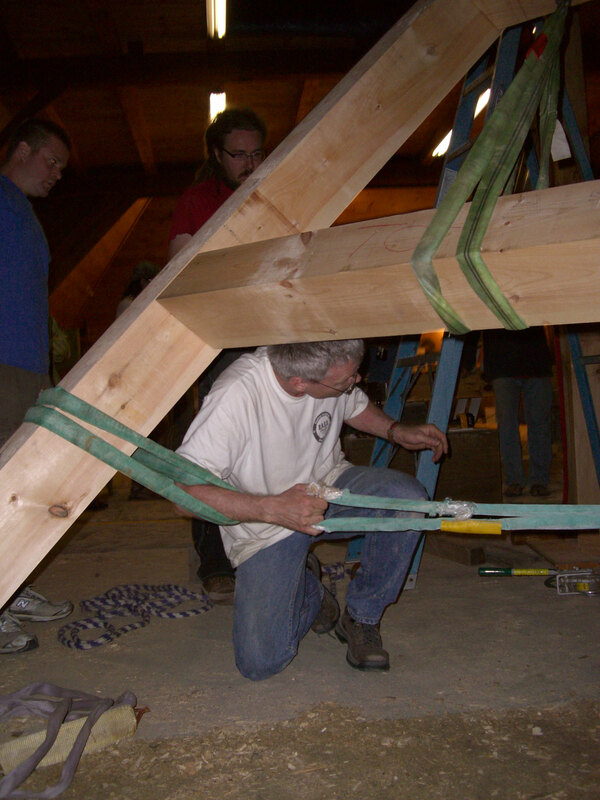 Assembling this roof section and strapping it together to hoist it (remember we can’t install the pegs which usually hold everything together) was a little bit of a problem given the shortage of straps and come-a-longs. 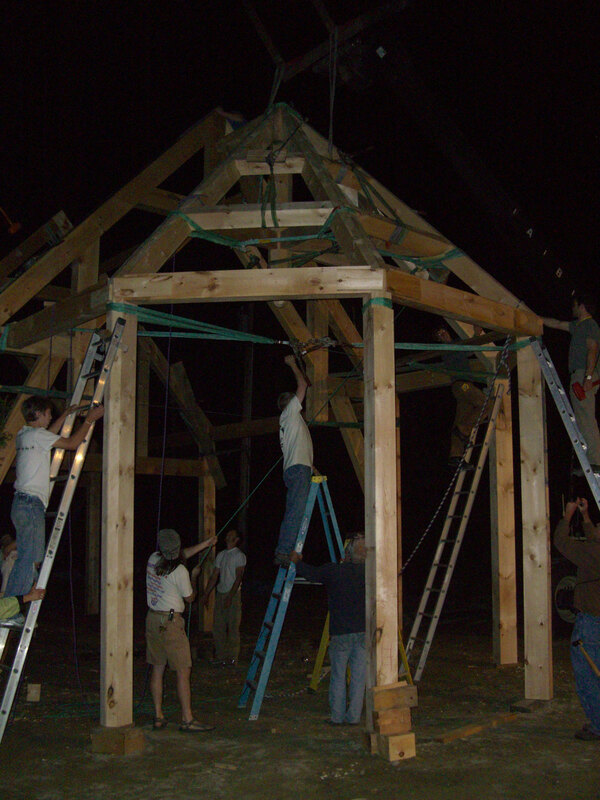 I eventually devised a solution using what little we had in the way of rigging and we were able to proceed with the assembly. 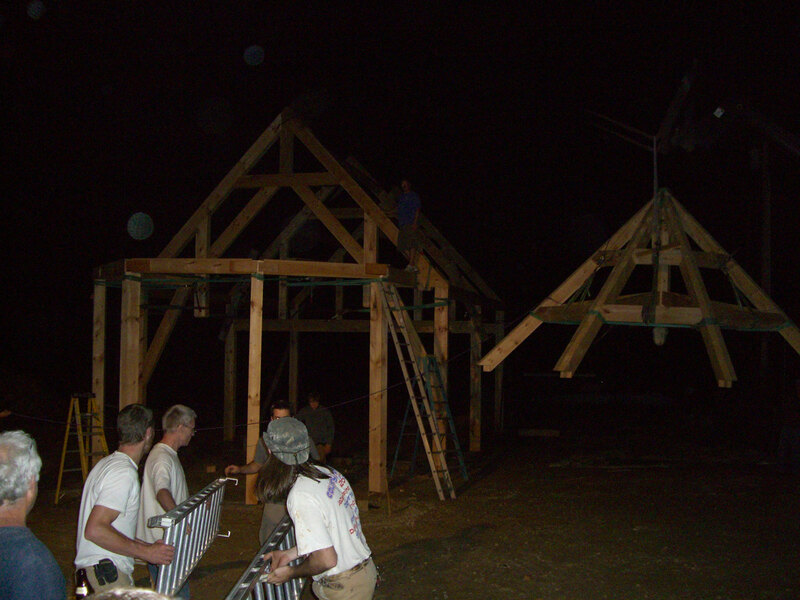 Nightime raising seems to be our norm. 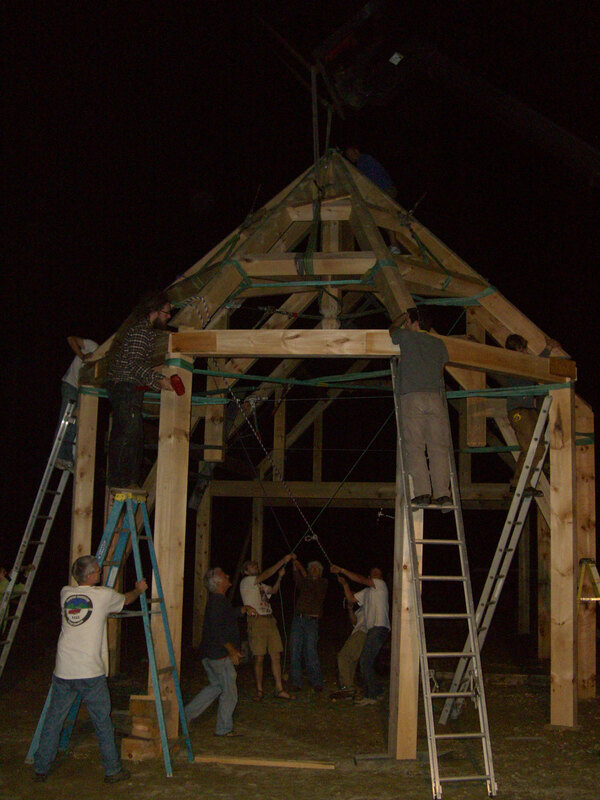 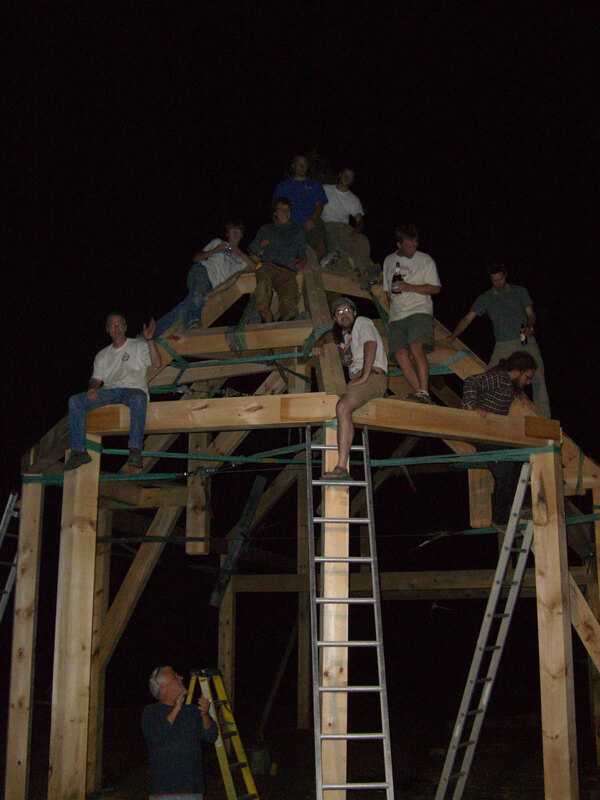 Again we didn’t make it to the actual raising during the daylight but everyone was game to put it up, so pizza was ordered and we set to work. 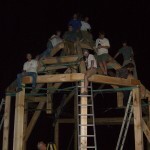 Here is the class photo in the dark once again. Too bad we couldn’t peg these joints and get some of these straps out of the way. 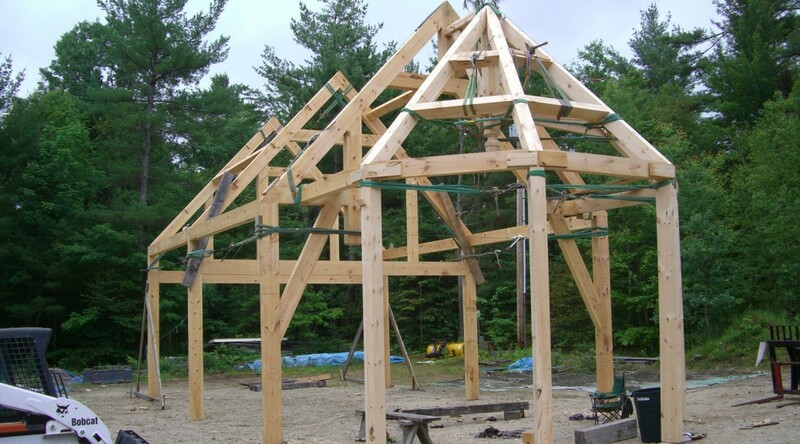 It’s actually quite a nice structure. 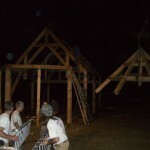 Some photos from the next day of the whole building…. 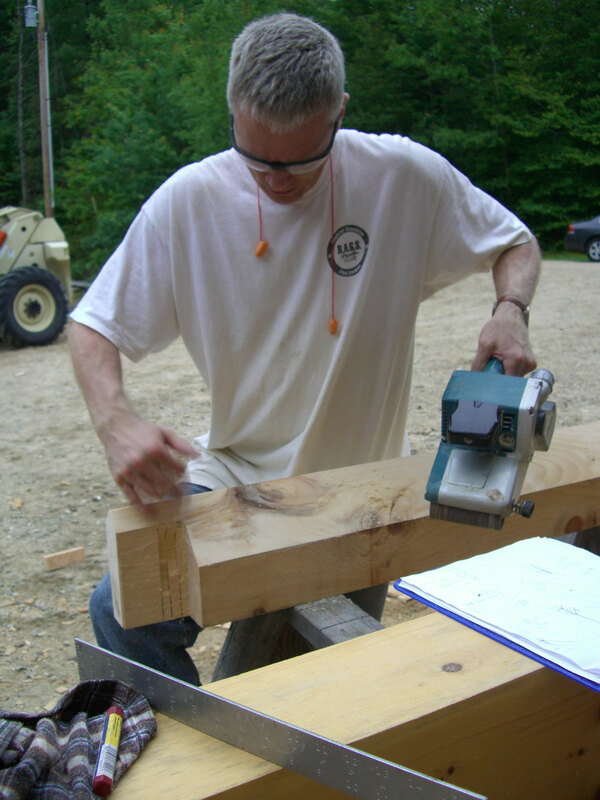 And a parting shot of me and my acorn. 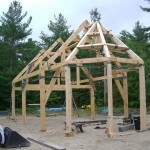 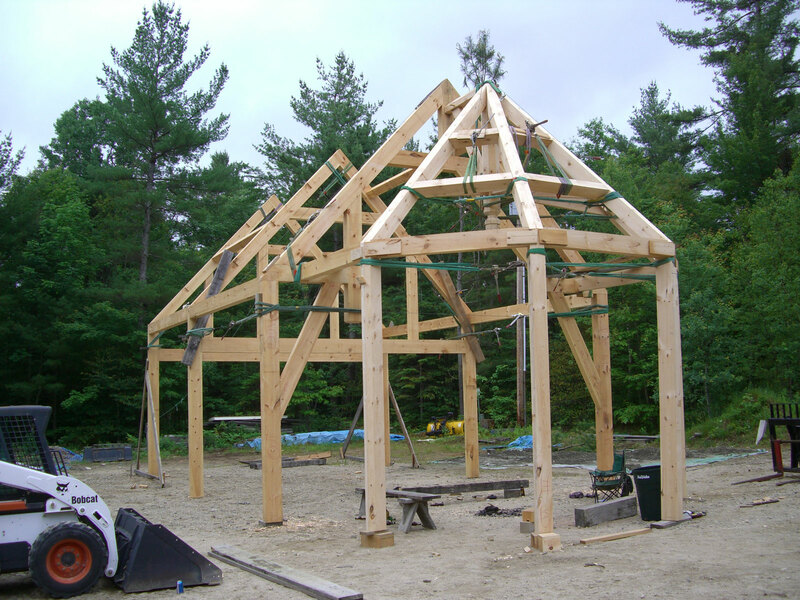 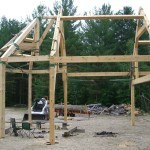 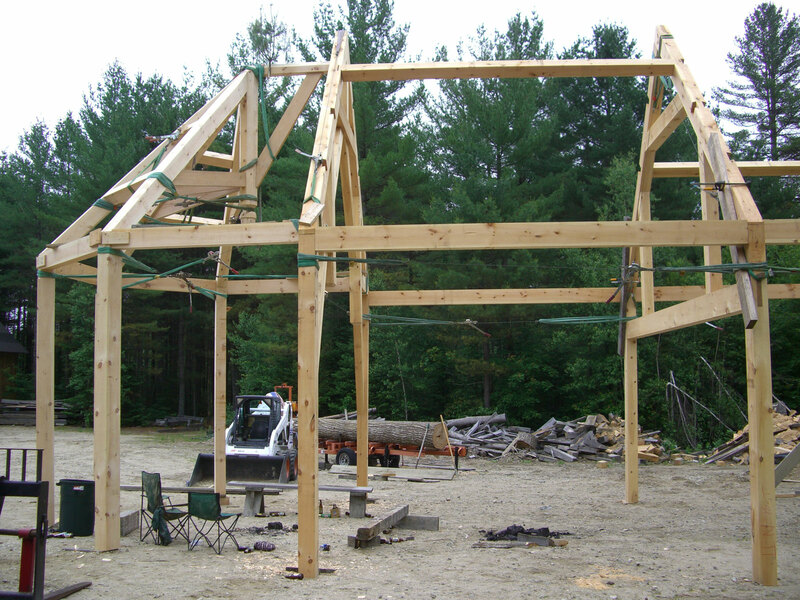 I hope to combine my new timber frame skills with my logging and build a nice workshop for my metalworking and woodworking hobbies in the near future.